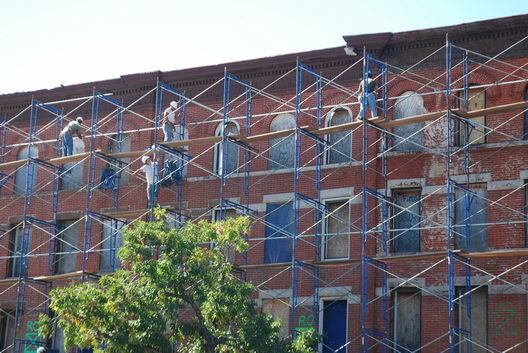 We happened upon the block of buildings at 150-158 Fourth Avenue between Butler and Douglass over the weekend as workers were climbing around putting up the scaffolding they'll be using during the demolition. Our friends at Brownstoner recently noted that the demolition has a green light. A twelve-story building is said to be slated for the site, which makes sense, given that zoning allows a structure of that size there. 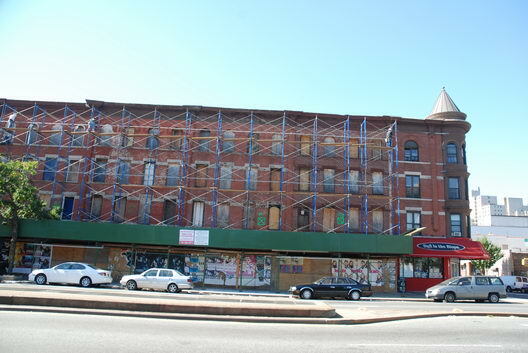 During the winter, we had run a photo of the same buildings boarded up in 1936 and, then, in 2007. The comparison won't be valid much longer. the one that just went up between baltic and butler on 4th is really hideous. I'm all for the 12 story buildings, but please not make them brick boxes! It's just getting depressing. Another Shot of the Semi-Unsheathed Willie B.